TONY ROCHFORD, who has been on hunger strike for the past 23 days in opposition to the property tax, has told TheJournal.ie that he is ‘very hopeful’ of meeting Taoiseach Enda Kenny but that any meeting must happen as soon as possible. Speaking through a friend present at his Trim, Co Meath home, Rochford made the acknowledgement after the Taoiseach said today during Leaders’ Questions that would be willing to meet Rochford to discuss his situation. Any meeting will have to initiated by the Taoiseach the friend added and that, given Rochford is already 23 days into his hunger strike, time should not be wasted. Along with his hunger strike, Rochford has been protesting outside Leinster House and the Four Courts but family members concerned about his condition have brought him home to spend time with him. A recent doctors report has shown that not only has Rochford lost a large amount of weight but he has also shown signs of low blood pressure and slight memory loss. In response to a question from Independent TD John Halligan, the Taoiseach thanked the deputy for introducing the matter but said that he did not know the circumstances of Rochford’s case. The Taoiseach said that mechanisms are in place to arrange for the deferment of the property charge in cases where individuals are unable to pay and said that he would be willing to meet Rochford to discuss both these and his specific situation. Rochford perviously spoke with TheJournal.ie where he explained how his non-payment of the property tax meant he was unable to apply for a tax clearance cert and as a result unable to work. Rochford who was described as being ‘very weak’ today will, health permitting, speak at the Larkin monument this coming Saturday. Email “Property tax hunger striker: Meeting with Taoiseach must happen soon”. 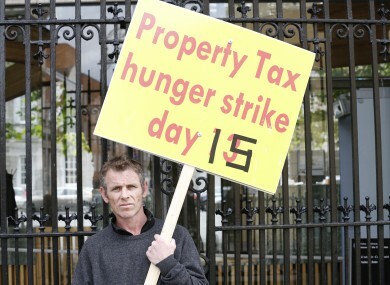 Feedback on “Property tax hunger striker: Meeting with Taoiseach must happen soon”.